Looking for children's dishes but not so sure about the Disney melamine and IKEA plastics anymore? We've found a great alternative in one of our latest finds -- the safe, durable and easy-to-clean Stainless Steel Divided Bus Plate. 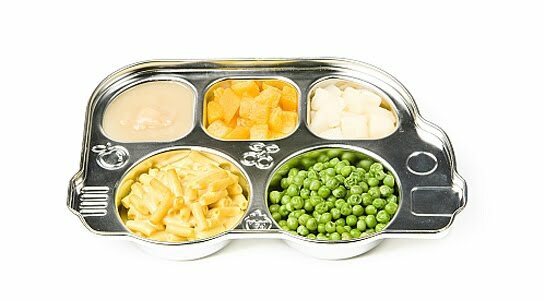 The 'Wheels on the Bus' take on a whole new meaning with our bus-shaped divided children's plate as your picky eaters will likely be speeding to the table just to use it! Kids love compartments -- at least ours do -- and many of them are adamant about keeping foods separate. Don't even think about mixing those mashed potatoes together with the peas! it will basically last forever. Made of top quality 304 food grade stainless steel this children's divided plate can easily stand up to all a toddler can throw at it and be thrown. The stainless steel bus plate can last a child well beyond the toddler years. Our sleek and simply designed Square Children's Divided Food Tray is another great option if your child is perhaps not into moving vehicles or is a wee bit older. Both stainless steel children's plates are available online at our eco boutique Lavish & Lime or feel free to drop by our warehouse shop in Vancouver, BC. For more ideas about living life a little greener and healthier, stop by our website.